The Durahesive Skin Barrier/Wafer with Convex-It maintains an effective protective seal longer than conventional skin barriers. Provides extra security for retracted or flush stomas. A "turtlenecking" effect that helps to prevent leakage around the stoma and skin breakdown for increased patient comfort and wear-time. 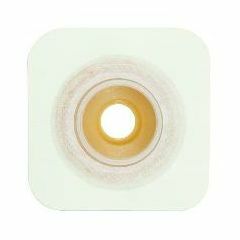 This skin barrier/wafer is designed with a low profile flange for wearing comfort. Easy Storage. Sturdy. Lightweight. Safe. Athletic. Medical Professional. Average Health. I use a hair dryer on the skin after the prep, and to warm the wafer to near-hot senation for better adherence. I have used this product for almost 7 years. <BR>I warm the new wafer on a heating pad while removing the old wafer. I dry the area around the stoma with a hair dryer after cleaning and again after applying the skin prep. <BR>I tried many other wafers and add-ons before finding this product - none of these other products worked - this product always does the job.